The next chapter begins in less than two moons! The final posters for "The Twilight Saga: New Moon" are hot off the presses -- and Kristen Stewart and Robert Pattinson don't want to let go of each other! 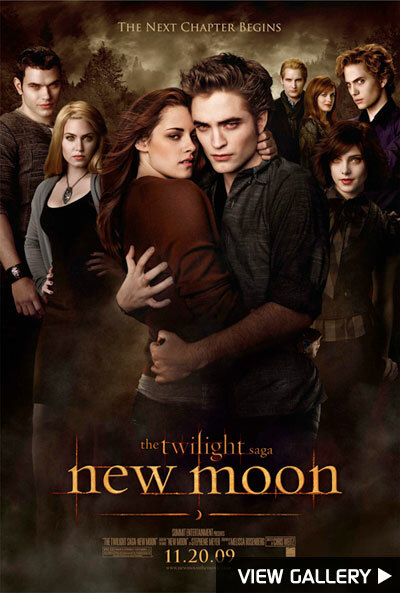 "New Moon" bites its way into theaters November 20. Satisfy your 'New Moon' craving with more pics from the set! Kristen returns as Bella Swan — but expect a more brooding, darker performance. Bella is heartbroken in “New Moon” after Edward leaves her — but things change when she grows closer with Jacob Black. In the novel, Edward is hardly seen, but in the film version of “New Moon,” RPattz fans will see plenty of Mr. Cullen. Audiences will see Edward appear as a figment of Bella’s imagination. Plus, he makes his long-awaited return to the screen after his brush with the Volturi in Italy. Jacob Black returns in a big way for “New Moon,” going front and center as Bella’s new love interest. Taylor packed on nearly 30 lbs. of muscle for the role. Alice Cullen returns to Forks, Wash. when Bella’s near-death experience causes Edward to attempt the unthinkable. Elizabeth plays Esme Cullen, matriarch of the Cullen family. Kellan returns as Emmett Cullen, companion to Rosalie. Kellan dyed his natural blond hair brunette for the role. Rosalie Hale is still not entirely fond of Bella in “New Moon.” In fact, she tells Edward that Bella might be dead — causing him to seek out the Volturi. Jasper attacks Bella during her birthday celebration, causing Edward to fear for Bella’s life and blame himself for putting her in danger. Jasper’s actions are the catalyst for Edward’s decision to end his life. Bronson plays Jared, a werewolf in Jacob’s pack. Kiowa plays Embry, a member of Jacob’s pack. Billy returns as Charlie Swan, Bella’s father. Charlie is devastated when he can’t pull Bella out of her depression. He describes her as acting as if someone had died, and is delighted when Bella takes up with Jacob. Chaske plays Sam Uley, leader of the La Push werewolf pack and a major impact on Jacob’s life. Edi plays Laurent, one of the three nomadic vampires from “Twilight.” Laurent returns to kill Bella — but is unsuccessful. Michael plays Aro, leader of the Volturi. Aro can read minds — and he has a dangerous fascination with Bella. Charlie plays Demetri, a member of the Volturi Guard known as a “tracker.” His tracking abilities are said to be better than James’. Daniel plays Felix, a member of the Volturi Guard known for his immense strength. Dakota plays Jane, a powerful member of the Volturi who can inflict pain with a simple glance. Anna plays Jessica Stanley, one of Bella’s first friends in Forks — but the two have a falling out in “New Moon” when Bella can’t pull herself out of her depression. Michael plays Mike Newton, a classmate with a crush on Bella. In “New Moon,” Mike asks Bella every day if she’ll come to work and nearly gives up on her. Christian plays Angela Weber, who becomes one of Bella’s best friends in “New Moon.” Bella loves that Angela doesn’t talk as much as Jessica. Gil plays Billy Black, Jacob’s father and Charlie’s best friend. He’s among the first to find Bella after Edward leaves her in the woods. Cameron plays Alec, one of the Volturi’s most trusted guards. He is Jane’s brother and has the ability to make a person blind, deaf and numb to feeling. Jamie plays Caius, a cruel and cold member of the Volturi who won’t let Bella leave Italy alive. Justin returns as Eric Yorkie, Bella’s classmate. Sign Up for Extra's Newsletter! Get the scoop on the hottest gossip, best fashions and more in Extra’s newsletter. Sign up now for your fast pass to the world of entertainment! Don't forget to check out the "Twilighters" group in our "Extra" community!